Mozilla plans to improve the way Firefox users can switch the default interface language of the browser and the spell checker that comes with it. Firefox users have to download language packs and dictionary packs from Mozilla's website currently to change the interface language or download the browser in a different locale. Most users of the browser who downloaded the browser in a language that they don't want to use have probably downloaded the browser in the correct language. It is possible to install the new language version over the old to switch to the new language. The workaround does not help Firefox users who want to use multiple interface languages. While it is theoretically possible to use different profiles each with its own language, or switch between languages using the preference intl.locale.requested, it is not really comfortable. If you look at how Chrome handles the switching to a different interface language, you will realize that Google's browser handles things much better. Chrome users select a different language in the settings to switch to it. A restart of the web browser is all that is required to display Chrome in the newly selected language. The language switching and dictionary switching process of Firefox will change significantly and for the better in the future. Basically, what Mozilla plans to do is integrate options to switch the interface language of the Firefox browser directly in the preferences. Mozilla plans to roll out the functionality in steps. 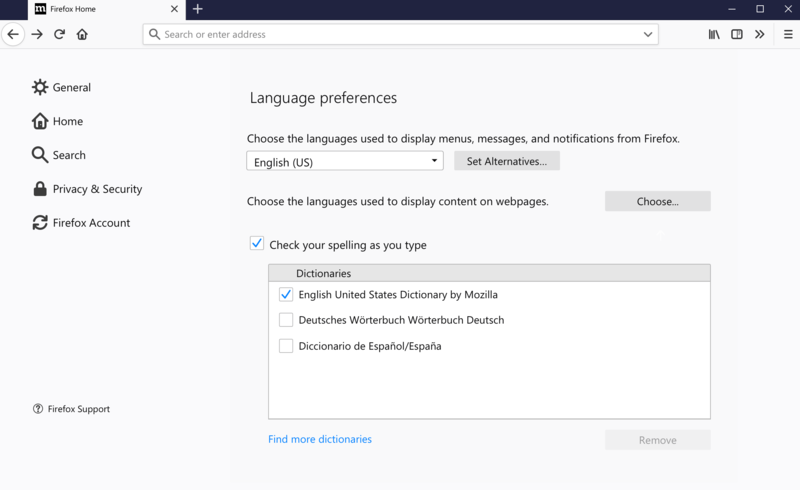 Firefox will display all installed languages under language preferences in the first stage; this makes it easy to switch to another of the languages as it can be selected. A link to download new language packs is provided in the first stage of implementation. The second stage makes it even easier as it is then possible to search for and install language packs directly from within Firefox similarly to how Google Chrome handles the functionality. Similar functionality improvements will be included for the supported spell checkers of the browser. Mozilla plans to list all installed spell checkers in a table on the preferences page. Firefox users may select and deselect dictionaries if available using the interface. Dictionaries will be downloaded alongside newly installed languages eventually, another useful feature that will improve language switching in Firefox. 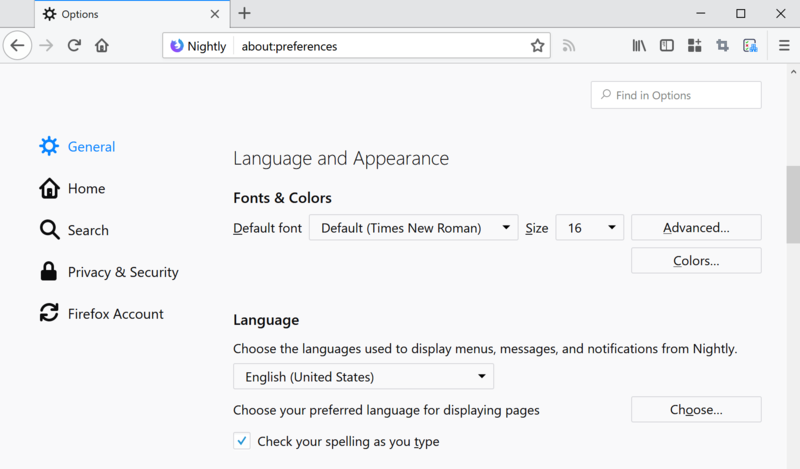 Firefox Nightly users may set the preference intl.multilingual.enabled to true to get some of the new functionality right away. Mozilla plans to improve the way Firefox users can switch the default interface language of the browser and the spell checker that comes with it. Nice new features indeed. Loving that there offering an improved interface language switching. Only the improved spelling is something that is where I have a question about. Do you Martin (Or anybody else) know or this improved spelling function is offering less -, the same – or even more possibilities as the free, Grammarly grammar and spelling WebExtension? It is offering less, basically only a word by word comparison between what you write and the dictionary. For privacy I use the ghacks-user.js with all user_prefs related to geolocation enabled. This “improvement” from Mozilla about languages do not concern me, only all bad changes concern me. “does not”, sorry for the typo. Functionality that makes FF distinct from Chrome? Remove! Functionality and UI tweaks that make FF indistinguishable from Chrome? We’re lovin’ it! Always the English interface here but English and French dictionaries, the former included in Firefox because I always install Firefox en-US, the latter downloaded from AMO. I have a few, very few settings in my userChrome.css file that depend on the interface language; their functions would become inefficient if I changed Firefox’s interface language (I’d have to modify the settings or double them). I hope this change will be for the best. I hate geo-localization features deciding to show me something in Spanish (I’m from Mexico) when everything in my PC and smartphone is installed in English (in order to practice ESL). Also having two or more dictionaries is much more streamlined in Chrome, where you simply select “your languages” and spellchecking works with all of them without having to manually switch back and forth (as I do in Firefox). I don’t care about “rebranding”. I want bookmarks, decent tabs management, and less memory hogging (which we didn’t have with the “old” Firefox).